While perhaps the epicenter, New Orleans is by no means the only place in the world to celebrate Mardi Gras. We are but one of many Mardi parties that take place across not only countries but continents. Varying from India to Germany, Canada to Belgium, carnival celebrations occur all over and take place in many forms, including Russia where it is called “Butter Week”. With Fat Tuesday traditions in Brazil, France, Trinidad, Italy, and Spain, too, it’s all but impossible to cover the history of them all in one article. Let’s delve into the history of three of these incredible festivities around the world. In this European city where water replaces streets, Mardi Gras celebrations date back to the Roman Empire. With beginnings in Saturnalia and spring solstice feasts, the Venetians version of this pre-Lent period is long standing. It is even said that in the 1100s Venice hosted a two-month-long party in the name of Fat Tuesday. Called Carnevale, this Italian Mardi Gras represents one of the more exquisite and elite celebrations. Carnevale is masquerade themed, enrobing the entire city with mystery as people flood the streets in their fanciest formal-wear, elaborate costumes, and ornately decorated masks. The use of masks is a tradition originally meant to dissolve classes, allowing the aristocracy and the common people to interact and engage with one another without the restraints of status. In today’s culture, however, the masks are instead meant to encourage freedom, bravery, and mischief through anonymity. This tradition brought Venice’s Carnevale to the height of celebrations in the 18th century, but not long after it was banned for several decades. Though it is unclear why the celebrations were banned, or by who, Carnevale was revived in 1979 and has been going strong ever since. Centered around the Piazza San Marco, Carnevale celebrations are mostly comprised of balls and costume parties. But the Piazza does offer the Rummelai, or the people’s carnival. Rummelai presents street plays, concerts, dances, and storytelling for the people to enjoy. As for parades, boats float in succession down the Grand Canal to the cheering of masked revelers. Dusseldorf’s Fastnacht or Karneval is a week-long celebration leading up to Shrove Tuesday (what we call Fat Tuesday). Their traditions are curious and diverse, starting with Alt Weiberstag, this loosely translates to “Old Hag’s Day” and is celebrated by women taking to the streets with scissors. They cut the ties off men brave enough to leave their houses and heckle them all in the hopes of getting kisses. While it may seem counterintuitive to trade defaced clothing for a kiss, this tradition is one of lightheartedness and fun, enjoyed across the city. Following Alt Weiberstag is Schmutziger Donnerstag or “Dirty Thursday”. Dirty Thursday represents a day of feasting and tomfoolery and is also when the Butcher’s Dance takes place. This dance is meant to celebrate the last slaughter before meat is banned for the length of Lent, replaced instead by fish. The final tradition of Karneval is the Rosenmontag Parade, which takes place on Rose Monday (or what we call Lundi Gras). The first parade occurred in 1825 and has been rolling ever since. This massive parade boasts ornately decorated floats and throws bunches of flowers and chocolate boxes to the eager and hungry watchers below. With their green glasses and stickers to beat of evil, Gilles take to the street. The Carnival of Binche dates back to the 14th century and incorporates a strange but alluring set of traditions with a history no one seems to be sure of. Taking place in Binche, Belgium, the Carnival of Binche has Mardi Gras themed performances and events beginning as many as seven weeks before Ash Wednesday. 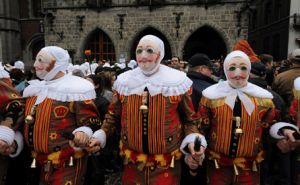 While these celebrations are diverse and intriguing, it’s the events that take place on Fat Tuesday itself that make the Carnival of Binche one of the most intriguing celebrations in the world. Referred to as a “Masterpiece of the Oral and Intangible Heritage of Humanity”, the Carnival of Binche centers around “Gilles”. “Gilles” are men that don vibrant costumes covered in bells, worn with clogs, (sometimes terrifying) wax masks, green glasses, and most importantly giant hats decorated in ostrich feathers. The “Gilles” roam the streets carrying giant sticks, meant to beat off evil and hand out oranges to those they pass. While it may seem like a strange gift, to receive an orange from a “Gille” is meant to bring you luck and if not that, then it certainly offers a good snack.